۱۹۱۰ پال هیزه آلمان "as a tribute to the consummate artistry, permeated with idealism, which he has demonstrated during his long productive career as a lyric poet, dramatist, novelist and writer of world-renowned short stories"
۱۹۲۷ آنری برگسون فرانسه "in recognition of his rich and vitalizing ideas and the brilliant skill with which they have been presented"
۱۹۵۸ بوریس پاسترناک جماهیر شوروی "for his important achievement both in contemporary lyrical poetry and in the field of the great Russian epic tradition"
۱۹۶۶ شموئل یوسف آگنون اسرائیل "for his profoundly characteristic narrative art with motifs from the life of the Jewish people"
نلی زاکس آلمان "for her outstanding lyrical and dramatic writing, which interprets Israel's destiny with touching strength"
۱۹۷۶ سال بلو ایالات متحده "for the human understanding and subtle analysis of contemporary culture that are combined in his work"
۱۹۷۸ ایزاک بشویس سینگر ایالات متحده "for his impassioned narrative art which, with roots in a Polish-Jewish cultural tradition, brings universal human conditions to life"
۱۹۸۱ الیاس کانتی انگلستان "for writings marked by a broad outlook, a wealth of ideas and artistic power"
۱۹۸۷ ایوسیف برودسکی ایالات متحده "for an all-embracing authorship, imbued with clarity of thought and poetic intensity"
۱۹۹۱ نادین گوردیمر آفریقای جنوبی "who through her magnificent epic writing has – in the words of Alfred Nobel – been of very great benefit to humanity"
۲۰۰۲ ایمره کرتس مجارستان "for writing that upholds the fragile experience of the individual against the barbaric arbitrariness of history"
۲۰۰۴ الفریده یلینک اتریش "for her musical flow of voices and counter-voices in novels and plays that with extraordinary linguistic zeal reveal the absurdity of society's clichés and their subjugating power"
۲۰۰۵ هارولد پینتر انگلستان "who in his plays uncovers the precipice under everyday prattle and forces entry into oppression's closed rooms"
۱۹۰۵ آدولف فون بایر آلمان "[for] the advancement of organic chemistry and the chemical industry, through his work on organic dyes and hydroaromatic compounds"
۱۹۰۶ هانری مواسان فرانسه "[for his] investigation and isolation of the element fluorine, and for [the] electric furnace called after him"
۱۹۱۰ اوتو والاخ آلمان "[for] his services to organic chemistry and the chemical industry by his pioneer work in the field of ترکیب‌های آلیفاتیک حلقویs"
۱۹۱۵ ریچارد ویلشتتر آلمان "for his researches on plant pigments, especially سبزینه"
۱۹۱۸ فریتس هابر آلمان "for the synthesis of ammonia from its elements"
۱۹۴۳ گئورگ دو هوسی Hungary "for his work on the use of isotopes as tracers in the study of chemical processes"
۱۹۶۱ ملوین کالوین United States "for his research on the carbon dioxide assimilation in plants"
۱۹۶۲ ماکس پراتز United Kingdom "for their studies of the structures of globular proteins"
۱۹۷۲ ویلیام اشتین United States "for his work on ribonuclease, especially concerning the connection between the amino acid sequence and the biologically active conformation"
۱۹۷۷ ایلیا پریگوژین Belgium "for his contributions to non-equilibrium thermodynamics, particularly the theory of dissipative structures"
۱۹۷۹ هربرت براون United States "for their development of the use of boron- and phosphorus-containing compounds, respectively, into important reagents in organic synthesis"
۱۹۸۰ پل برگ United States "for his fundamental studies of the biochemistry of nucleic acids, with particular regard to recombinant-DNA"
والتر گیلبرت United States "for their contributions concerning the determination of base sequences in nucleic acids"
۱۹۸۱ رولد هافمن United States "for their theories, developed independently, concerning the course of chemical reactions"
۱۹۸۲ ارون کلوگ United Kingdom "for his development of crystallographic electron microscopy and his structural elucidation of biologically important nucleic acid-protein complexes"
۱۹۸۵ جروم کارل United States "for their outstanding achievements in developing direct methods for the determination of crystal structures"
۱۹۹۲ رادولف مارکوس United States "for his contributions to the theory of electron transfer reactions in chemical systems"
۱۹۹۸ والتر کوهن United States "for his development of the density-functional theory"
۲۰۰۴ هارون تسیخانوور اسرائیل "for the discovery of ubiquitin-mediated protein degradation"
۲۰۰۶ راجر کورنبرگ United States "for his studies of the molecular basis of eukaryotic transcription"
۲۰۰۹ عادا یونات Israel "for studies of the structure and function of the ریبوزوم"
۱۹۰۸ ایلیا مچنیکو Russia "in recognition of their work on immunity"
۱۹۱۴ رابرت بارانی Austria "for his work on the physiology and pathology of the vestibular apparatus"
۱۹۲۲ اتو فریتز میرهوف آلمان "for his discovery of the fixed relationship between the consumption of oxygen and the دگرگشت of اسید لاکتیک in the muscle"
۱۹۳۰ کارل لندستینر Austria "for his discovery of human blood groups"
۱۹۳۱ اتو واربورگ آلمان "for his discovery of the nature and mode of action of the respiratory enzyme"
۱۹۳۶ اتو لوی Austria "for their discoveries relating to chemical transmission of nerve impulses"
۱۹۴۴ جوزف ارلنگر United States "for their discoveries relating to the highly differentiated functions of single آسهs"
۱۹۴۵ ارنست چین United Kingdom "for the discovery of پنی‌سیلین and its curative effect in various infectious diseases"
۱۹۴۶ هرمان جوزف مولر United States "for the discovery of the production of جهشs by means of پرتو ایکس irradiation"
۱۹۴۷ جرتی کوری United States "for their discovery of the course of the catalytic conversion of گلیکوژن"
۱۹۵۰ تادئوس ریچستین Switzerland "for their discoveries relating to the هورمونs of the adrenal cortex, their structure and biological effects"
۱۹۵۲ سلمان واکسمن United States "for his discovery of استرپتومایسین, the first آنتی‌بیوتیک effective against سل"
۱۹۵۳ هانس آدولف کربس United Kingdom "for his discovery of the چرخه اسید سیتریک"
فریتس لیپمان United States "for his discovery of co-enzyme A and its importance for intermediary metabolism"
۱۹۵۸ جاشوآ لدربرگ United States "for his discoveries concerning نوترکیبی ژنی and the organization of the genetic material of باکتری"
۱۹۵۹ آرتور کورنبرگ United States "for their discovery of the mechanisms in the biological synthesis of آران‌ای and دی‌ان‌ای"
۱۹۶۴ کنراد امیل بلوک United States "for their discoveries concerning the mechanism and regulation of the کلسترول and اسید چرب دگرگشت"
۱۹۶۵ فرانسوا یاکوب France "for their discoveries concerning genetic control of enzyme and virus synthesis"
۱۹۶۷ جورج والد United States "for their discoveries concerning the primary physiological and chemical visual processes in the eye"
۱۹۶۸ مارشال وارن نیرنبرگ United States "for their interpretation of the رمز ژنتیکی and its function in protein synthesis"
۱۹۶۹ سالوادور لوریا United States "for their discoveries concerning the replication mechanism and the genetic structure of ویروس (زیستی)es"
۱۹۷۰ ژولیوس اکسلراد United States "for their discoveries concerning the humoral transmittors in the nerve terminals and the mechanism for their storage, release and inactivation"
۱۹۷۲ جرالد ادلمن United States "for their discoveries concerning the chemical structure of پادتن"
۱۹۷۵ دیوید بالتیمور United States "for their discoveries concerning the interaction between tumour viruses and the genetic material of the cell"
۱۹۷۶ باروخ ساموئل بلومبرگ United States "for their discoveries concerning new mechanisms for the origin and dissemination of infectious diseases"
۱۹۷۷ اندرو شالی United States "for their discoveries concerning the peptide hormone production of the مغز"
روزالین سوسمن یالو United States "for the development of radioimmunoassays of peptide hormones"
۱۹۷۸ دنیل ناتانس United States "for the discovery of اندونوکلئازهای محدودکنندهs and their application to problems of ژنتیک مولکولی"
۱۹۸۰ باروخ بن الصراف United States "for their discoveries concerning genetically determined structures on the cell surface that regulate immunological reactions"
۱۹۸۲ جان وین (داروشناس) United Kingdom "for his discoveries concerning پروستاگلاندینs and related biologically active substances"
United Kingdom "for theories concerning the specificity in development and control of the دستگاه ایمنی and the discovery of the principle for production of پادتن‌های تک‌تیره"
۱۹۸۵ مایکل اس. براون United States "for their discoveries concerning the regulation of کلسترول دگرگشت"
۱۹۸۶ Stanley Cohen United States "for their discoveries of growth factors"
۱۹۸۸ گرترود بی. الیون United States "for their discoveries of important principles for drug treatment"
۱۹۸۹ هارولد وارموس United States "for their discovery of the cellular origin of retroviral آنکوژنs"
United States "for his discoveries concerning reversible پروتئین فسفرگیری as a biological regulatory mechanism"
۱۹۹۴ آلفرد جی. گیلمان United States "for their discovery of جی پروتئینs and the role of these proteins in ورارسانی پیام in cells"
۱۹۹۷ استنلی پریسینر United States "for his discovery of پریونs – a new biological principle of infection"
۱۹۹۸ رابرت فرانسیس فوچگات United States "for their discoveries concerning نیتریک اکسید as a signalling molecule in the cardiovascular system"
۲۰۰۰ پائول گرینگارد United States "for their discoveries concerning ورارسانی پیام in the دستگاه عصبی"
۲۰۰۲ سیدنی برنر United Kingdom "for their discoveries concerning 'genetic regulation of organ development and programmed cell death'"
۲۰۰۴ ریچارد اکسل United States "for their discoveries of odorant receptors and the organization of the دستگاه بویایی"
۲۰۰۶ اندرو فایر United States "for his discovery of آران‌ای سرکوبگر – gene silencing by double-stranded RNA"
۲۰۱۱ بروس بویتلر ایالات متحده آمریکا به خاطر «اکتشافات فعال‌سازی سیستم ایمنی ذاتی بدن». ۲۰۱۳ جیمز روثمن United States for "their discoveries of machinery regulating vesicle traffic, a major transport system in our cells"
۱۹۰۷ آلبرت آبراهام مایکلسون United States "for his optical precision instruments and the spectroscopic and metrological investigations carried out with their aid"
۱۹۰۸ گابریل لیپمن فرانسه "for his method of reproducing colours photographically based on the phenomenon of interference"
۱۹۲۱ آلبرت اینشتین آلمان "for his services to Theoretical Physics, and especially for his discovery of the law of the اثر فوتوالکتریک"
۱۹۲۲ نیلز بور Denmark "for his services in the investigation of the structure of atoms and of the radiation emanating from them"
۱۹۲۵ جیمز فرانک آلمان "for their discovery of the laws governing the impact of an الکترون upon an atom"
۱۹۴۳ اتو اشترن United States "for his contribution to the development of the molecular ray method and his discovery of the گشتاور مغناطیسی of the پروتون"
۱۹۴۴ ایزیدور ایزاک رابی United States "for his resonance method for recording the magnetic properties of atomic nuclei"
۱۹۴۵ Wolfgang Pauli Austria "for the discovery of the Exclusion Principle, also called the اصل طرد پاولی"
۱۹۵۲ فلیکس بلاک United States "for their development of new methods for nuclear magnetic precision measurements and discoveries in connection therewith"
۱۹۵۴ ماکس برن United Kingdom "for his fundamental research in مکانیک کوانتوم, especially for his statistical interpretation of the wavefunction"
۱۹۵۸ لیا فرانک Soviet Union "for the discovery and the interpretation of the Cherenkov effect"
۱۹۵۹ Emilio Gino Segrè Italy "for their discovery of the پادپروتون"
۱۹۶۰ دونالد آرتور گلایزر United States "for the invention of the bubble chamber"
۱۹۶۱ رابرت هافستاتر United States "for his pioneering studies of electron scattering in atomic nuclei and for his thereby achieved discoveries concerning the structure of the nucleons"
۱۹۶۲ لو لاندائو Soviet Union "for his pioneering theories for فیزیک ماده چگال, especially liquid helium"
۱۹۶۳ Eugene Paul Wigner United States "for his contributions to the theory of the atomic nucleus and the elementary particles, particularly through the discovery and application of fundamental symmetry principles"
۱۹۶۵ ریچارد فاینمن United States "for their fundamental work in الکترودینامیک کوانتومی, with deep-ploughing consequences for the physics of elementary particles"
۱۹۶۷ هانس بته United States "for his contributions to the theory of nuclear reactions, especially his discoveries concerning the energy production in ستارهs"
۱۹۶۹ موری گل‌مان United States "for his contributions and discoveries concerning the classification of elementary particles and their interactions"
۱۹۷۱ دنیس گابور United Kingdom "for his invention and development of the holographic method"
۱۹۷۲ لئون نیل کوپر United States "for his jointly developed theory of ابررسانایی, usually called the نظریه بی‌سی‌اس"
۱۹۷۳ بریان دیوید جوزفسون United Kingdom "for his theoretical predictions of the properties of a supercurrent through a tunnel barrier, in particular those phenomena which are generally known as the Josephson effect"
۱۹۷۵ بن روی ماتلسن Denmark "for the discovery of the connection between collective motion and particle motion in atomic nuclei and the development of the theory of the structure of the atomic nucleus based on this connection"
۱۹۷۶ برتون ریشتر United States "for his pioneering work in the discovery of a heavy elementary particle of a new kind"
۱۹۷۸ آرنو آلان پنزیاس United States "for his discovery of تابش زمینه کیهانی"
۱۹۷۹ شلدون لی گلاشو United States "for their contributions to the theory of the unified weak and electromagnetic interaction between elementary particles, including, inter alia, the prediction of the weak neutral current"
۱۹۸۸ لیان لدرمن United States "for the نوترینو beam method and the demonstration of the doublet structure of the لپتونs through the discovery of the muon neutrino"
۱۹۹۰ جروم ایزاک فریدمان United States "for his pioneering investigations concerning deep inelastic scattering of electrons on protons and bound neutrons, which have been of essential importance for the development of the quark model in particle physics"
۱۹۹۲ جورج چرپک فرانسه "for his invention and development of particle detectors, in particular the multiwire proportional chamber"
۱۹۹۵ مارتین لویز پرل United States "for the discovery of the تاو (ذره)" and "for pioneering experimental contributions to لپتون physics"
فردریک رینز United States "for the detection of the نوترینو" and "for pioneering experimental contributions to لپتون physics"
۱۹۹۶ David Morris Lee United States "for their discovery of ابرشارهity in helium-3"
۱۹۹۷ کلود کوهن تانوژی فرانسه "for development of methods to cool and trap atoms with laser light"
۲۰۰۰ ژورس آلفروف Russia "for developing نیمه‌رسانا heterostructures used in high-speed- and optoelectronics"
۲۰۰۴ دیوید گراس United States "for the discovery of آزادی مجانبی in the theory of the نیروی هسته‌ای قوی"
۲۰۰۵ روی جی. گلوبر United States "for his contribution to the quantum theory of optical coherence"
۲۰۱۱ آدم ریس آمریکا "برای کشف انبساط شتابان جهان از طریق ابرنواخترهای دوردست." ۲۰۱۲ سرژ هاروش France "for ground-breaking experimental methods that enable measuring and manipulation of individual quantum systems"
۲۰۱۳ فرانسوا انگلرت Belgium "for the theoretical discovery of a mechanism that contributes to our understanding of the origin of mass of subatomic particles, and which recently was confirmed through the discovery of the predicted fundamental particle, by the ATLAS and CMS experiments at CERN's Large Hadron Collider"
۱۹۱۱ توبیاس آسر The Netherlands "Initiator of the Conferences on International Private Law at the Hague; Cabinet Minister; Lawyer"
آلفرد فرید Austria "Journalist; Founder of Die Friedenswarte"
۱۹۶۸ رنه کسن فرانسه "President of the European Court for Human Rights"
۱۹۷۳ Henry A. Kissinger United States "For the 1973 Paris agreement intended to bring about a cease-fire in the Vietnam War and a withdrawal of the American forces"
۱۹۷۸ مناخم بگین اسرائیل "for the Camp David Agreement, which brought about a negotiated peace between Egypt and Israel"
۱۹۸۶ الی ویزل United States "Chairman of "The President's Commission on the Holocaust""
۱۹۹۴ اسحاق رابین Israel "to honour a political act which called for great courage on both sides, and which has opened up opportunities for a new development towards fraternity in the Middle East." Poland "for his efforts to diminish the part played by nuclear arms in international politics and, in the longer run, to eliminate such arms"
۱۹۷۰ پل ساموئلسون United States "for the scientific work through which he has developed static and dynamic economic theory and actively contributed to raising the level of analysis in economic science"
۱۹۷۱ سیمون کوزنتس United States "for his empirically founded interpretation of economic growth which has led to new and deepened insight into the economic and social structure and process of development"
۱۹۷۲ کنت آرو United States "for his pioneering contributions to general economic equilibrium theory and welfare theory"
United States "for the development of the input-output method and for its application to important economic problems"
United States "for his contributions to the theory of optimum allocation of resources"
۱۹۷۶ میلتون فریدمن United States "for his achievements in the fields of consumption analysis, monetary history and theory and for his demonstration of the complexity of stabilization policy"
۱۹۷۸ هربرت الکساندر سیمون United States "for his pioneering research into the decision-making process within economic organizations"
۱۹۸۰ لارنس کلاین United States "for the creation of econometric models and the application to the analysis of economic fluctuations and economic policies"
United States "for his pioneering analyses of saving and of financial markets"
۱۹۸۷ رابرت سولو United States "for his contributions to the theory of economic growth""
۱۹۹۰ هری مارکوویتز United States "for their pioneering work in the theory of financial economics""
۱۹۹۲ گری بکر United States "for having extended the domain of microeconomic analysis to a wide range of human behaviour and interaction, including nonmarket behaviour""
۱۹۹۳ رابرت فوگل United States "for having renewed research in economic history by applying economic theory and quantitative methods in order to explain economic and institutional change"
۲۰۰۱ جوزف استیگلیتز United States "for his analyses of markets with asymmetric information"
United States "for having integrated insights from psychological research into economic science, especially concerning human judgment and decision-making under uncertainty"
United States "for having enhanced our understanding of conflict and cooperation through game-theory analysis"
۲۰۰۷ لئونید هورویچ United States "For having laid the foundations of mechanism design theory"
۲۰۰۸ پل کروگمن United States "for his analysis of trade patterns and location of economic activity"
۲۰۱۰ پیتر دیاموند United States "for his analysis of markets with search frictions"
↑ "Nobel Prize in Literature ۱۹۱۰". Nobel Foundation. Retrieved ۲۰۰۸-۱۰-۱۷. ↑ "Nobel Prize in Literature ۱۹۲۷". Nobel Foundation. Retrieved ۲۰۰۸-۱۰-۱۷. ↑ "Nobel Prize in Literature ۱۹۵۸". Nobel Foundation. Retrieved ۲۰۰۸-۱۰-۱۷. ↑ ۵٫۰ ۵٫۱ "Nobel Prize in Literature ۱۹۶۶". Nobel Foundation. Retrieved ۲۰۰۸-۱۰-۱۷. ↑ "Nobel Prize in Literature ۱۹۷۶". Nobel Foundation. Retrieved ۲۰۰۸-۱۰-۱۷. ↑ "Nobel Prize in Literature ۱۹۷۸". Nobel Foundation. Retrieved ۲۰۰۸-۱۰-۱۷. ↑ "Nobel Prize in Literature ۱۹۸۱". Nobel Foundation. Retrieved ۲۰۰۸-۱۰-۱۷. ↑ "Nobel Prize in Literature ۱۹۸۷". Nobel Foundation. Retrieved ۲۰۰۸-۱۰-۱۷. ↑ "Nobel Prize in Literature ۱۹۹۱". Nobel Foundation. Retrieved ۲۰۰۸-۱۰-۱۷. ↑ "Nobel Prize in Literature ۲۰۰۲". Nobel Foundation. Retrieved ۲۰۰۸-۱۰-۱۷. ↑ "Nobel Prize in Literature ۲۰۰۴". Nobel Foundation. Retrieved ۲۰۰۸-۱۰-۱۷. ↑ Billington, Michael (2007). Harold Pinter. London: Faber and Faber. p. ۲. .
↑ "Nobel Prize in Literature ۲۰۰۵". Nobel Foundation. Retrieved ۲۰۰۸-۱۰-۱۷. ↑ Georgina Ferry (2008). Max Perutz and the secret of life. New York: Cold Spring Harbor Laboratory Press. p. 2. ISBN 0701176954. ↑ "The Nobel Prize in Chemistry 1972". Nobelprize.org. Retrieved 2008-10-06. ↑ ۲۹٫۰ ۲۹٫۱ "The Nobel Prize in Chemistry 1980". Nobelprize.org. Retrieved 2008-10-06. ↑ "The Nobel Prize in Chemistry 1998". Nobelprize.org. Retrieved 2008-10-06. ↑ "The Nobel Prize in Physiology or Medicine 1922". Nobel Foundation. Retrieved 2007-07-28. ↑ "The Nobel Prize in Physiology or Medicine 1947". Nobel Foundation. Retrieved 2007-07-28. ↑ ۵۱٫۰ ۵۱٫۱ "The Nobel Prize in Physiology or Medicine 1953". Nobel Foundation. Retrieved 2007-07-28. ↑ "The Nobel Prize in Physiology or Medicine 1958". Nobel Foundation. Retrieved 2007-07-28. ↑ ۶۳٫۰ ۶۳٫۱ "The Nobel Prize in Physiology or Medicine 1977". Nobel Foundation. Retrieved 2007-07-28. ↑ The Nobel Prize in Physiology or Medicine 2011. . Nobel Foundation. Retrieved on 2011-10-05. ↑ "The Nobel Prize in Physiology or Medicine 2011". Nobel Foundation. ↑ "The Nobel Prize in Physics 1907". Nobel Foundation. Retrieved 2008-10-09. ↑ "The Nobel Prize in Physics 1908". Nobel Foundation. Retrieved 2008-10-09. ↑ "The Nobel Prize in Physics 1921". Nobel Foundation. Retrieved 2008-10-09. ↑ "The Nobel Prize in Physics 1922". Nobel Foundation. Retrieved 2008-10-09. ↑ "The Nobel Prize in Physics 1925". Nobel Foundation. Retrieved 2008-10-09. ↑ "The Nobel Prize in Physics 1943". Nobel Foundation. Retrieved 2008-10-09. ↑ "The Nobel Prize in Physics 1944". Nobel Foundation. Retrieved 2008-10-09. ↑ Pauli had three Jewish grandparents. When discussing his plans to leave Switzerland in 1940, he wrote "Actually I suppose I am under German law 75 per cent Jewish." "Wolfgang Pauli – Failed naturalisation and departure to the USA". Retrieved 2010-03-08. ↑ "The Nobel Prize in Physics 1945". Nobel Foundation. Retrieved 2008-10-09. ↑ "The Nobel Prize in Physics 1952". Nobel Foundation. Retrieved 2008-10-09. ↑ "The Nobel Prize in Physics 1954". Nobel Foundation. Retrieved 2008-10-09. ↑ "The Nobel Prize in Physics 1958". Nobel Foundation. Retrieved 2008-10-09. Marshall Sklare (1982). Understanding American Jewry. Transaction Publishers. p. 108. ISBN 9780878554546. Alan Symons (2000). Nobel laureates, 1901–2000. Polo Publishing. p. 202. ISBN 0952375133. Tamm was born in Vladivostok, Russia on July 8, 1895 into an old established Jewish family. Joan Comay; Lavinia Cohn-Sherbok (2002). Who's who in Jewish history: after the period of the Old Testament. Routledge. p. 362. ISBN 9780415260305. Bernard S. Schlessinger; June H. Schlessinger (1996). The who's who of Nobel Prize winners, 1901-1995. Oryx Press. p. 201. ISBN 9780897748995. Parents: Father, Evgen Tamm; Mother, Olga Davidova Tamm. Nationality: Russian. Religion: Jewish. Ioan Mackenzie James (2009). Driven to innovate: a century of Jewish mathematicians and physicists. Peter Lang. p. 262. ISBN 9781906165222. ↑ "The Nobel Prize in Physics 1959". Nobel Foundation. Retrieved 2008-10-09. ↑ "The Nobel Prize in Physics 1960". Nobel Foundation. Retrieved 2008-10-09. ↑ "The Nobel Prize in Physics 1961". Nobel Foundation. Retrieved 2008-10-09. ↑ "The Nobel Prize in Physics 1962". Nobel Foundation. Retrieved 2008-10-09. ↑ "The Nobel Prize in Physics 1963". Nobel Foundation. Retrieved 2008-10-09. ↑ "The Nobel Prize in Physics 1967". Nobel Foundation. Retrieved 2008-10-09. ↑ "The Nobel Prize in Physics 1969". Nobel Foundation. Retrieved 2008-10-09. ↑ "The Nobel Prize in Physics 1971". Nobel Foundation. Retrieved 2008-10-09. ↑ "The Nobel Prize in Physics 1972". Nobel Foundation. Retrieved 2008-10-09. ↑ "The Nobel Prize in Physics 1973". Nobel Foundation. Retrieved 2008-10-09. ↑ "The Nobel Prize in Physics 1975". Nobel Foundation. Retrieved 2008-10-09. ↑ "The Nobel Prize in Physics 1976". Nobel Foundation. Retrieved 2008-10-09. ↑ "The Nobel Prize in Physics 1978". Nobel Foundation. Retrieved 2008-10-09. ↑ "The Nobel Prize in Physics 1979". Nobel Foundation. Retrieved 2008-10-09. ↑ "The Nobel Prize in Physics 1988". Nobel Foundation. Retrieved 2008-10-09. ↑ "The Nobel Prize in Physics 1990". Nobel Foundation. Retrieved 2008-10-09. ↑ "The Nobel Prize in Physics 1992". Nobel Foundation. Retrieved 2008-10-09. ↑ ۱۱۳٫۰ ۱۱۳٫۱ "The Nobel Prize in Physics 1995". Nobel Foundation. Retrieved 2008-10-09. ↑ "The Nobel Prize in Physics 1996". Nobel Foundation. Retrieved 2008-10-09. ↑ "The Nobel Prize in Physics 2000". Nobel Foundation. Retrieved 2008-10-09. ↑ "The Nobel Prize in Physics 2003". Nobel Foundation. Retrieved 2008-10-09. ↑ "The Nobel Prize in Physics 2004". Nobel Foundation. Retrieved 2008-10-09. ↑ ۱۱۹٫۰ ۱۱۹٫۱ "The Nobel Prize in Physics 2005". Nobel Foundation. Retrieved 2008-10-09. خطای یادکرد: برچسب <ref> نامعتبر؛ نام «N05» چندین بار با محتوای متفاوت تعریف شده‌است. (صفحهٔ راهنما را مطالعه کنید.). ↑ ۱۲۰٫۰ ۱۲۰٫۱ "The Nobel Prize in Physics ۲۰۱۱". Nobel Foundation. Retrieved 2011-10-05. ↑ "The Nobel Prize in Physics 2013". Nobel Foundation. ↑ "The Nobel Peace Prize 1911". Nobel Foundation. Retrieved 2008-11-12. ↑ Lundestad, Geir (2001-03-15). "The Nobel Peace Prize, 1901–2000". Nobel Foundation. Retrieved 2008-11-28. ↑ "The Nobel Prize in Economics 1970". Nobel Foundation. Retrieved 2008-10-20. ↑ "The Nobel Prize in Economics 1971". Nobel Foundation. Retrieved 2008-10-20. ↑ "The Nobel Prize in Economics 1972". Nobel Foundation. Retrieved 2008-10-20. ↑ "The Nobel Prize in Economics 1973". Nobel Foundation. Retrieved 2008-10-20. ↑ "The Nobel Prize in Economics 1975". Nobel Foundation. Retrieved 2008-10-20. ↑ "The Nobel Prize in Economics 1976". Nobel Foundation. Retrieved 2008-10-20. ↑ "The Nobel Prize in Economics 1978". Nobel Foundation. Retrieved 2008-10-20. ↑ "The Nobel Prize in Economics 1980". Nobel Foundation. Retrieved 2008-10-20. ↑ "The Nobel Prize in Economics 1985". Nobel Foundation. Retrieved 2008-10-20. ↑ "The Nobel Prize in Economics 1987". Nobel Foundation. Retrieved 2008-10-20. ↑ "The Nobel Prize in Economics 1990". Nobel Foundation. Retrieved 2008-10-20. ↑ "The Nobel Prize in Economics 1992". Nobel Foundation. Retrieved 2008-10-20. ↑ "The Nobel Prize in Economics 1993". Nobel Foundation. Retrieved 2008-10-20. ↑ "The Nobel Prize in Economics 1994". Nobel Foundation. Retrieved 2008-10-20. ↑ "The Nobel Prize in Economics 2001". Nobel Foundation. Retrieved 2008-10-20. ↑ "The Nobel Prize in Economics 2002". Nobel Foundation. Retrieved 2008-10-20. ↑ "Brief Bio – Robert J Aumann". Robert Aumann. Retrieved 2010-04-17. Robert Aumann was born in Frankfurt am Main, Germany, in 1930, to a well-to-do orthodox Jewish family. ↑ "The Nobel Prize in Economics 2005". Nobel Foundation. Retrieved 2008-10-20. ↑ Seymour "Sy" Brody. "Leonid Hurwicz: Nobel Prize in Economics Recipient-2007". Florida Atlantic University Libraries. Retrieved 2010-03-31. ↑ "Leonid Hurwicz (1917–2008)". Jewish Virtual Library. American-Israeli Cooperative Enterprise. Retrieved 2010-03-31. 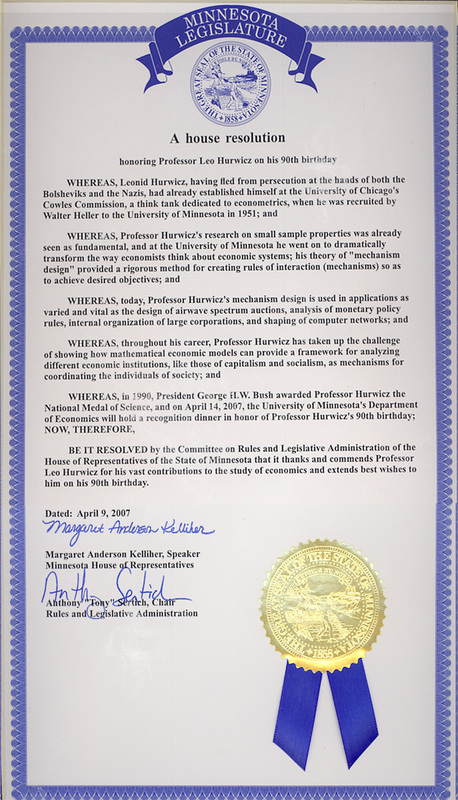 ↑ "A house resolution honoring Professor Leo Hurwicz on his 90th birthday". Legislature of the State of Minnesota (image via University of Minnesota, umn.edu). 9 April 2007. Archived from the original on 2007-10-25. Retrieved 2007-10-16. ↑ "The Nobel Prize in Economics 2007". Nobel Foundation. Retrieved 2008-10-20. ↑ "The Nobel Prize in Economics 2008". Nobel Foundation. Retrieved 2009-10-20. ↑ "The Nobel Prize in Economics 2012". Nobel Foundation. Retrieved 2012-10-15. Charpa, Ulrich; Deichmann, Ute. (eds.) (2007). Jews and Sciences in German Contexts: Case Studies From the 19th and 20th Centuries, Mohr Siebeck, pp. 23–25. Feldman, Burton (2001). The Nobel Prize: A History of Genius, Controversy, and Prestige, Arcade Publishing, pp. 407–10. Julius, Anthony (1995). T. S. Eliot, Anti-Semitism, and Literary Form, انتشارات دانشگاه کمبریج, p. 266. Lazarus, William P.; Sullivan, Mark. (2008). Comparative Religion For Dummies, جان وایلی و پسران, p. 45. Patai, Raphael (1996). The Jewish Mind, Wayne State University Press, pp. 339–42. Rubinstein, W. D. (1982). The Left, the Right and the Jews, Croom Helm , p. 63. Scharfstein, Sol (1999). Understanding Jewish Holidays and Customs: Historical and Contemporary, KTAV Publishing House, p. 168. Shalev, Baruch Aba (2005). 100 Years of Nobel Prizes, The Americas Group, first publishing in 2002. Weiss, Mosheh (2004). A Brief History of the Jewish People, Rowman & Littlefield, pp. 216–17. Zuckerman, Harriet (1996). Scientific Elite: Nobel Laureates in the United States, انتشارات ترانسکشن, originally publishing in 1977, pp. 71–78. این صفحه آخرین‌بار در ‏۲۴ مارس ۲۰۱۹ ساعت ‏۰۶:۴۹ ویرایش شده‌است.